Emory University political scientist Drew Linzer, who created and runs the Votamatic website, paid a visit to Middlebury College last Wednesday to discuss why, based on his forecast model, he believes President Obama is still the heavy favorite to win the presidential election. To construct his model, Drew uses his colleague Alan Abramowitz’ “Time for A Change” forecast model as his baseline starting point. You will recall from one of my earlier posts that Abramowitz’s forecast model uses three factors — the incumbent president’s net approval rating at the end of June, the change in real GDP in the second quarter of the election year and a first-term incumbency advantage — to predict the winner of the national popular vote. However, during the current election cycle Abramowitz updated his traditional model to include a “polarization” variable that, in effect, reduces the advantage enjoyed by a first-term incumbent running for reelection by about half – from a bit more than 5% to closer to 2.5%. Under his “new” model, Abramowitz projects Obama’s share of the two-party vote to be about 50.3%. As I’ve discussed before, not everyone accepts Abramowitz’s rationale for updating his model. Drew is one of the skeptics, and so his forecast model starts with the “old” Abramowitz model which is decidedly more bullish regarding Obama’s chances. Without the polarization variable, Abramowitz’s structural baseline component has Obama winning 52.2% of the two-party national vote. That’s a much stronger starting advantage for the President than the “new” Abramowitz model suggests. The second component in Drew’s model is the state-based polls, which he uses to “update” the Abramowitz baseline forecast. As we get closer to Election Day, state-level survey data influences his projection more and more, and Abramowitz’s structural component becomes correspondingly less important. At this point, 10 days out, the state-level polling component is really driving his forecast almost entirely. So, where does the race stand, according to Drew’s model? As I discussed in my Economist post, as of today, he projects Obama to win 332 Electoral College votes, or 62% of the 538 Electoral College votes, compared to Romney’s 206. Note that Drew makes several assumptions in his model. First, he makes no effort to adjust for the “house effects” of individual polls in the belief that in the closest states that are polled most frequently, polling biases will largely cancel out. Second, he essentially assumes that the “undecideds” will break in rough proportion to the distribution of the vote, as indicated by the polls, in each state. Third, since he is interested in forecasting the Electoral College vote, he pays no attention to national tracking polls. It is doubtful that Drew, or anyone, could have constructed such a forecast model even eight years ago. But the proliferation of state polls, particularly in contested states, now allows political scientists to adjust their structural models in light of recent polling on a state-by-state basis. Of course, this type of modeling is in its infancy; Drew only has one previous election cycle, in 2008, to calibrate his assumptions. I asked Drew what would happen if he changed his baseline starting point by, for example, substituting Doug Hibbs’ Bread and Peace forecast model, which predicts that Obama will win closer to 47% of the two-party vote – or about 5% below the Abramowitz projection. Drew acknowledged that this would shift the baseline parameter enough to move several swing states into Romney’s column. Nonetheless, based on a state-by-state electoral projection and given the current polling, even with this shift Drew does not believe that Romney would gain enough Electoral College votes to overcome Obama’s current projected advantage. Is Drew right? Remember, for some time now I have been arguing that the state-level polls will gradually align with the national tracking polls, which as of today are showing a much closer race, with some indicating that Romney has pulled into a narrow lead. How much must Romney gain in the key swing states to overcome Obama’s polling lead? Using the RealClearPolitics state polling averages, Owen Witek created the following table showing the state of the race in the 12 closest state races as of today (Electoral College votes are in parentheses). The last column contains an estimate of the number of undecided voters in each state. Based on the RCP averages (and remember that Drew’s state-based polling formula includes a structural component and thus is different than the RCP simple averaging), Obama right now has 201 Electoral College votes in strong and lean states, compared to Romney’s 191. That leaves 146 electoral votes in the 11 swing states listed in the table still up for grabs. How likely is it that Romney can pick up the additional 79 needed to reach 270? If he holds his “lead” in Virginia, North Carolina and Florida, he picks up 57 more, leaving him with 22 to go. Assuming a small shift in voter sentiment, he might also squeak to victory in Colorado, earning another 9 electoral votes, leaving him 13 to go. But here is where the math becomes difficult for Romney, and why Drew – as of today – believes Obama will hold on. Obama leads by more than 2% in all the remaining battleground states. His smallest lead is 2.3% in three states: Ohio, Iowa and Wisconsin. Looking only at these three, Romney needs to win either Ohio, or Iowa and Wisconsin, to reach the 270 mark. But, as Witek shows, there are not very many undecideds left in either Iowa or Wisconsin, so they would have to break strongly in Romney’s favor for him to eke out a victory in both states. That means Ohio may still be Romney’s best path to victory, and that assumes Obama loses the other states – no sure thing. Remember, Romney got perhaps a 2.7% boost from the first widely-watched debate that was generally viewed as a convincing win for him. How likely is it that he will be able to almost match that total in the last 10 days among the much small number of undecideds in the absence of a similar focusing event? Keep in mind that all these calculations are based on polls that are, by nature, very squishy, so we ought not treat the RCP averages as having more precision than they do. In this respect, Drew’s model, which uses a different algorithm to analyze the polls and predict the final outcome in each state, presents a slightly different picture in the battleground states. Here are Drew’ state-based calculations, complete with the 95% confidence interval. (Note the cool color coding!). As you can see by the vertical line in the middle demarcating the 50% threshold, he projects that Obama will do slightly better in key states than a simple reading of the RCP polling averages might suggest. In contrast to my simple RCP average, he has Florida, Virginia and Colorado all leaning toward Obama (although with a confidence interval that suggests Romney might be leading in all three states). That means Romney has that much of a bigger hill to climb among the undecideds. Of course, if Romney does begin to close the gap in the swing states, Drew’s model will pick that up, and it will adjust the forecast accordingly. Regardless of the outcome, however, there is one overriding reason why you should be visiting his site for the next 10 days: in contrast to other forecasters (you know who I mean), Drew’s methodology is completely transparent. Anyone can see and utilize his modeling equation, which he describes at length in this journal article (which has been peer-reviewed and accepted for publication). Moreover, as an academic, Drew’s rooting interest in this race is to see whether his forecasting tool is validated. He has much less at stake if the model turns out to be wrong. If it is wrong, however, he can tell us why. I call that progress. P.S If you are coming to this site for the first time (there’s been a lot of traffic of late) I encourage you to follow me on Twitter at @MattDickinson44 – I tweet all new posts there. First, in Drum’s defense, he’s responding to the edited version of the comments I sent to Jamelle Bouie late last night that were published today in Bouie’s blog post at the American Prospect. As I noted in my earlier post today, readers of Bouie’s article may come away with a slightly misleading impression of what I said to him in those comments. That appears to be the case with Drum – he is responding to the excerpts Bouie published, and not my full post here. Still, it is worth quoting him in full if for no other reason to illustrate how partisan pundits think. After quoting my excerpt in Bouie’s piece, Drum explodes (in an article titled “Today’s Adventures in Pseudo Profundity”! ): “Why do people say stuff like this? Of course the electorate is highly polarized. Of course 70% of voters have already made up their minds. So what? Campaign ads aren’t aimed at these people. They’re aimed at the small segment of the population that’s persuadable, just like every advertisement for every product in history. That’s not even Political Science 101. It’s more like junior high school level stuff. Let’s start with the most obvious error, and go from there. First, despite Drum’s assertion, it is NOT obvious that the electorate is highly polarized. In fact, all the evidence suggests just the opposite – the electorate is not highly polarized at all. I’ve covered the data on this before, so I trust I need not go into it again. The idea that Americans are deeply divided, of course, is a recurring meme from partisan bloggers, so Drum’s mistake puts him in good company. But it’s a mistake nonetheless. The truth is that most Americans do not share Drum’s extreme partisan leanings – or that of those occupying the extreme right wing either. Second, Drum would have us believe that the 30% or so of voters yet to make up their minds are “persuadable” via, presumably, campaign ads such as the ones the Obama campaign are running about Bain. (Note that contrary to Drum’s impression, my comments to Bouie re: the 70% referred to the impact of Bain as an issue, broadly defined, not to a specific campaign ad, but never mind.) Alas, there’s not much evidence that this is true either. While a small proportion of voters may be genuinely undecided, most of the remaining 30% lean in one partisan direction or the other and that lean will likely determine how they vote – and how they react to the Bain controversy (if they bother to pay attention to it this early in the campaign). And for those who are truly persuadable, it’s almost certainly the case that the state of the economy, as captured in broad-gauged measures such as unemployment and GDP growth, will be more influential than the debate over Mitt’s tenure at Bain. Third, Drum overstates the impact of any single campaign advertisement. The reality is that the impact of campaign ads is rather short-lived, and that in the high-information environment characteristic of presidential campaigns, when voters will be saturated with advertisements from both sides, no single advertisement is likely to carry the day. The impact of the Bain controversy will almost certainly be drowned out by the barrage of events and related campaign advertising to come. My point here is not to disparage Drum’s partisan leanings. He clearly thinks electing Mitt would be bad for the country, and he could be right. But that’s no excuse for exaggerating the likely influence of the Bain controversy, or for simply misstating some pretty fundamental political facts. Let me be clear. I’m sympathetic to Drum’s plight – the guy he wants to win is facing stiff headwinds in the form of a stubbornly weak economy. Given this weak fundamental, it’s clear that Drum wants – desperately wants – to believe that the Bain controversy is going to be a turning point in this campaign. But if wishes were horses, beggars would ride. Alas, the historical evidence suggests this isn’t likely to be the case no matter how much Drum and his fellow partisans cite each other as evidence that the Bain controversy is, in fact, a turning point. It just isn’t. Sorry, Kevin. Bain’s not going to swing this election to Obama. But let’s focus on the positive: you are ready for junior high! Romney or Obama: Who Wins the Beer Test? The other day I was watching my go-to source for informed political analysis, ABC’s The View, where the topic du jour was whether one would prefer to have a beer with Mitt Romney or President Obama. This “beer test” question, of course, is supposed to measure a candidate’s likability factor. How well does he empathize with the common man? I first heard the question used to explain why Al Gore barely won the popular vote, and lost the Electoral College, to George Bush in 2000, despite running as the incumbent party standard bearer during a time of peace and prosperity. Gore may have been smarter, the pundits suggested, but the thought of listening to him drone on about the social security lockbox was enough to swing more than a few votes to Bush. Simply put, more people preferred to down a pint with George than with Al. As Fiorina suggests, there’s no immediate pattern linking higher ratings on personal qualities to victory in the election. 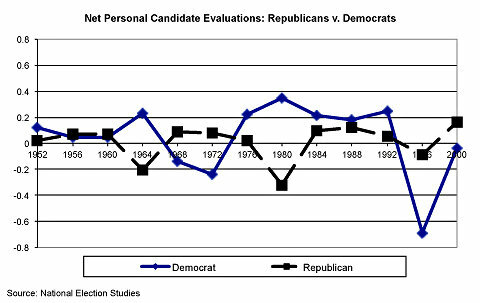 Moreover, Fiorina notes that in 1980, Jimmy Carter was rated the highest on personal qualities among all Democratic nominees in this period, and yet he was soundly trounced by Ronald Reagan. In 1996, on the other hand, Bill Clinton was the lowest rated candidate – either Democrat or Republican – to run in the 13 elections Fiorina studied, and yet he easily bested World War II veteran Bob Dole. The point here is one I’ve made before: presidential elections are driven by fundamentals – national conditions and candidates’ issue positions – far more than they are by the candidates’ personal qualities. Indeed, I don’t know of a single reputable presidential election forecast model that incorporates likability ratings. Knowing which candidate the public prefers to have a beer with isn’t going to be very helpful in predicting who is going to win the election. Alas, this is a point that will undoubtedly get lost as pundits like those on The View begin applying the beer test to judge the likability of Mitt Romney or Barack Obama. For what it is worth (and my point is that it is not worth much relative to other factors), Obama has the likability edge over Romney, at least based on recent Gallup poll. His edge extends to independents, but not Republicans. And yet, at the same time this poll was in the field, Gallup’s daily tracking polls had Romney and Obama in essentially a dead heat. The reason why, I suspect, has something to do with the split among independents on questions 4 – agrees with you on the issues – and 5 – who can manage government more efficiently. The answers to those questions, history indicates, will tell us more about the election outcome than will the likability gap. For what it is worth, I’m not sure I want a beer with either candidate. Mitt, who doesn’t drink, would just make me feel guilty as the night dragged on and he sipped on his non-alcoholic beverage. And Obama might be sitting at my table, but I’m guessing he wouldn’t be talking to me so much as at me. With either one, then, it would be a long night, and not in an enjoyable way. All in all, I’d rather drink alone.